Now everywhere I look I see owls! I am not an owl hater – in fact, Tucson is home to one of THE CUTEST and SMALLEST OWL’S EVER… The Elf Owl! 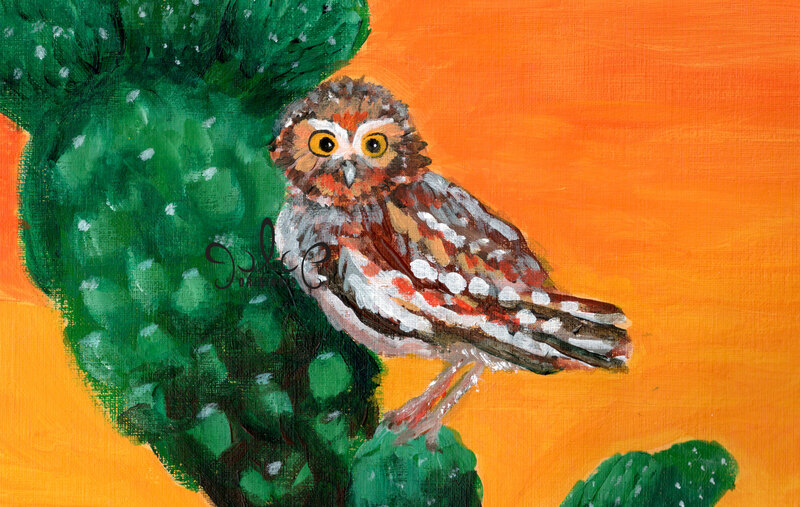 The Elf Owl was the subject of my fifth painting for my alphabet animal series. I chose to paint one sitting on a cactus. I wish that I could have somehow captured the scale of it better – they are only about 5″ tall. Did I mention – they’re sooooo cute! I had much more fun painting this guy versus the snake I previously painted. I might even sell some art prints of the painting. Then I could own the 86,822 owl item on ETSY! Have you purchased anything with an owl on it?